Watco, a Texas based manufacturer of shop welded tanks, leveraged Kinetech to design an intelligent cloud-based multi-parameter scheduling ERP to optimize their production scheduling. Watco Tanks is an industry leading shop welded tank manufacturer that builds custom aboveground and approved underground tanks (Permatank, Fireguard, etc). With over 50 years of experience and a manufacturing facility covering 20 Acres, Watco serves some of the largest energy companies in the world. With dozens of workers, hundreds of projects, and many constraints in their production scheduling process (delivery date, worker skill sets, materials, etc) the management team at Watco struggled to accurately forecast the effect and downstream impact of unplanned time off, changes in project priority (i.e. a rush order), and material constraints. 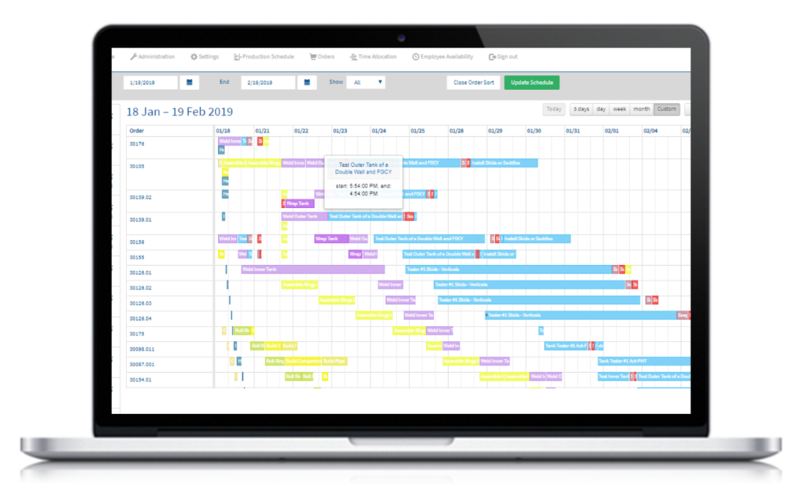 As the business grew, Excel and off the shelf scheduling software was inadequate to capture the unique processes of this industry-leading manufacturer. Their production schedule is so dynamic that an FTE was unable to keep up with the cascading impacts of unplanned time off, or rush orders placed by diamond clients. Watco engaged Kinetech to build a custom scheduling software that could handle the multiple variables required to dynamically produce a production schedule. In six weeks, Kinetech developed a cloud based web and mobile application that keeps Watco's workforce on task, and allows the management team to understand the downstream impacts of a changing production schedule. Watco's management team sets their parameters from the admin page (i.e. required steps to build a Permatank, estimated time to complete each task, worker skill sets, etc), inputs their incoming order requests, then chooses the desired production order (usually by required delivery date). The Kinetech application then runs a proprietary algorithm against the various time constraints to produce a production schedule that informs Watco of the optimal personnel and material allocation to hit their deadlines. Example Production Schedule after the Kinetech algorithm factors in all resources, constraints, and project priority. The application has created a triple digit return on investment as Watco is now able to achieve visibility into their schedule and potential downstream impacts of any given change. The integrated mobile application assists workers in the field by instructing them which tasks they should be working on next, while feeding data back to Watco management on the actual results delivered against their initial forecasts. This allows Watco to continuously tweak the schedule for optimal utilization. Manufacturers looking to build the Digital Factory of the future leverage Kinetech to design intelligent cloud-based multi-parameter solutions to optimize their production and parlay their strategic and operational advantage into stronger financial performance. Watco Tanks is an industry leading shop welded tank manufacturer that builds custom aboveground and approved underground tanks (Permatank, Fireguard, etc). With over 50 years of experience and a manufacturing facility covering 20 Acres in south Texas, Watco serves some of the largest energy companies in the world.